Awana is a global, nonprofit ministry with fully integrated evangelism and long-­term discipleship programs for ages 2 to 18 that actively involves parents and church leaders. Each week, more than 4 million children and youth, 470,000 volunteers and 260 field staff take part in Awana in over 47,000 churches around the world. Offered through local churches, Awana reaches kids where they’re at and walks alongside them in their faith journey. Activities each night are broken into three distinct phases. Our strategy here is to meet the needs of every child – from the rambunctious child who has energy to burn to the inquisitive one who loves to hear stories. We even have themes each week to make it even more fun! Game Time: Individual and team competition takes place through circle games and playground favorites. Every child gets involved every night and has a chance to unleash his or her energy. Handbook Time: Children work one-on-one with a trained leader to complete assignments in his/her book. Awana emphasizes memorization and understanding of key Bible verses that show how to know God and walk with Him. A series of awards and trophies reward achievements at every level as kids progress. Council Time: Everyone gathers together for announcements, award distribution and, most importantly, a practical Bible message. 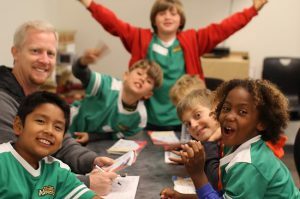 At Bethel, Awana meets on Wednesdays from 6:25-8:00 p.m. during the school year. 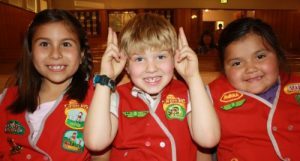 Awana began this year on September 12th. Stop by the table in the foyer at Bethel on Sundays to fill out registration forms and purchase a book ($11) and uniform ($12-17). You can also sign up on Wednesdays if you come a little early. Dues are $20 per child for the year. Throughout the year, you can register on Sunday mornings or Wednesday nights at the Kids’ Welcome Desk. Have more Questions? Email Tracey or call 701.232.4476. A great way to invest in your children and the next generation. A place to serve together. Volunteer positions are available for nursery, preschool and elementary kids. During our ministry year you can join us at any time. It takes over 100 volunteers to make Awana run smoothly each week. To volunteer, email Delia or call/text her at 701.730.1956.